Michael Klotz is a dedicated teacher. 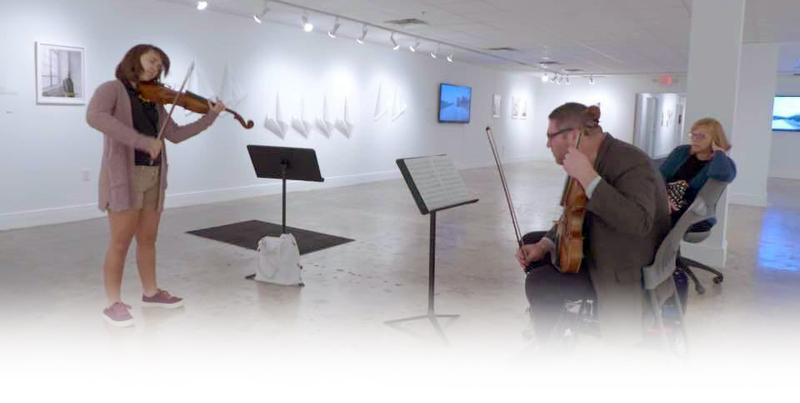 As Senior Instructor of Viola and Chamber Music, and Artist-in-Residence at Florida International University, he maintains a high level of international students from the US, Ireland, South and Central America, Mexico, Canada, and Israel. 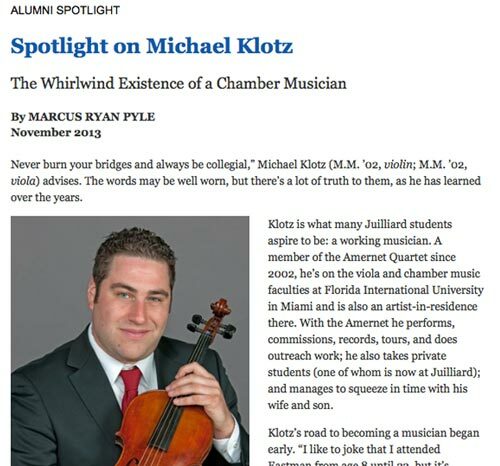 For more information about studying with Michael Klotz at FIU please visit: www.carta.fiu.edu/music. 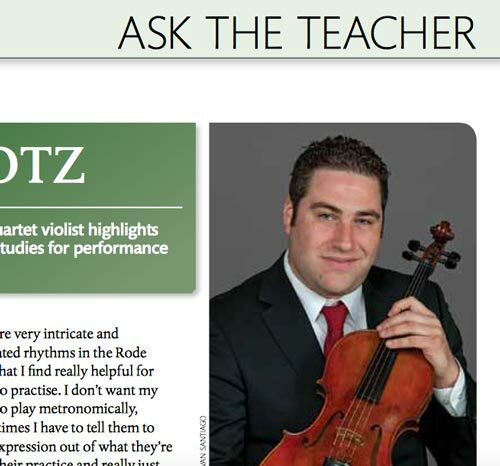 Michael Klotz also accepts a limited number of award-winning private violin and viola students. Recent high school students have been accepted to prestigious schools of music such as the Curtis Institute of Music, The Juilliard School, Cleveland Institute of Music, Indiana University Jacobs School of Music, and the University of Michigan School of Music. Teaching is one of the most noble and rewarding professions. As Senior Instructor of Viola at Florida International University, I am charged with the task of imparting this glorious art form to music performance and music education majors, as well as non-music majors, at the undergraduate and graduate levels. I am also dedicated to teaching gifted pre-college student, who consistently garner awards, scholarships, and admission to the most competitive conservatories of music, universities, and music festivals. I feel very fortunate to be able to share my lifelong passion for music with my students. As a child, growing up in Rochester, NY, I began attending the Eastman School of Music’s Preparatory Division at the age of eight. For the next fourteen years I studied music in the Preparatory and College Divisions at Eastman with some of the world’s most important performers and scholars. Subsequently, I moved to New York to further my education at The Juilliard School with other outstanding musicians and revered scholars. These individuals helped me develop my musicianship and also became important examples for me to follow in all aspects of life. For me, the true essence of the student-teacher relationship is that the teacher will bear an everlasting positive effect on the student artistically and morally speaking. I teach my students to be their own teachers. Listening attentively, rather than passively, is s very difficult task. In one-on-one viola and violin lessons, I work tirelessly with students on technical points such as intonation, articulation, bow distribution, tone production, tone color, and dynamics, as well as musical style. I believe that a student must possess technical and intellectual skill when approaching a work of music. For example, if a student of mine is studying a work of Mozart, I direct them to learn other works of Mozart by listening and following the score. They should be able to discuss the work they are studying from a historical standpoint (year the work was written, other significant works written around that time) and must be able to recognize and discuss any pertinent structural and theoretical elements of the work. When working on intonation, I often have the students sing a passage, paying close attention to the intervals and being able to temper the intervals ever so slightly to show tonal flexibility. This helps the expressive component of a work and indeed increases the student’s sensitivity toward their intonation. Career guidance and mentoring are integral parts of the teacher’s responsibilities toward their students. At the graduate level, students are at a crucial point where they will soon enter the work force or continue their studies toward an advanced degree, or both. I draw from my vast network of contacts locally, nationally, and internationally to assist my students in any way I possibly can. My commitment to my students continues beyond their studies at FIU or in my private studio. I continue to mentor and guide my students toward successful careers in music after graduation. I feel that my students’ success in the music world is essential for my continued success as a pedagogue. Interested in scheduling a lesson with Michael?